These School Halloween Party Ideas are in a class of their own! Lots of schools like to put on a Halloween party for their pupils. Its also a common event for parent groups to organize as part of their school fundraising programmes. This needs some good old fashioned scary music. Something like Michael Jackson's Thriller would be great. Everyone dances their own "Monster Stomp". But every so often a teacher dressed as a wicked witch appears. She makes the music stop and as she does so she casts a spell turning the children to stone statues. "Turn to stone in the shape of a ghost!" and the children have to stand in the position of that statue. After a set time the spell is broken, the music comes back on and the children can dance once more. You may want to demonstrate good poses to younger children. What could be better than turning your teacher into a Mummy! About 10 toilet rolls per team or old white sheets ripped to form bandages. Divide your children into a number of teams. Show them a picture of a scary Monster Mummy (think Scooby Do). Each team has a teacher with them. They then have 3 minutes to wrap their teacher. You will probably need to put an adult helper with each team. The masking tape is quite helpful in tidying up loose "starts and ends". Make sure you wrap the teachers legs individually rather than bind them together. At the end of 3 minutes call time whereupon the scary Teacher-Mummies need to stand in the middle to be judged and…. admired?! Scatter some Halloween sweets or other objects around the room. Each team now has to sit still around a bucket cheering on their Teacher-Mummy who runs around picking up these party treats one at a time returning to drop it in their teams bucket one by one. This gets more difficult and funnier as they slowly start to unravel. The better your Mummy the more treats for your team. Do you have a "Monster Memory" or are you "Frighteningly Forgetful"? This is a Halloween version of what is sometimes known as "Kims Game". Usually about 20 small items are placed on a tray and shown to the contestants. After a minute these are hidden and everyone has to write down either individually or in teams as many as they can remember. The size of a school event allows you to do a bigger version of this. Arrange your memory objects in a separate room to where your party is taking place and bring the children in to see them before taking them out again and continuing as normal. A scary sport for Hockey Mad Hags! This is fun if you have the space. 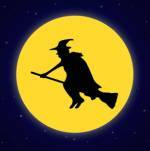 Rather than hockey sticks you use small witch's brooms and a tennis ball (could be decorated like an eyeball). Either have a five a side or perhaps 2 individuals battle it out during quick 1 minute contests. Its more fun if the witches have their hats on but you may like to add a string or elastic to keep them on. Tug of war is always really popular with children and its easy to give it a Halloween twist. Simply tie a rubber bat or spider so it dangles from the rope. Line up teams of children along the rope either side with the smallest kids being towards the middle. Position 2 witch's cauldrons in front of each team. Call your teams names such as Goblins, Monsters, Ghouls etc. On "Go" they have to pull the bat over to their side and drop it in their cauldron. All the children have a guess at how heavy they think a large pumpkin is. Its a good idea to have a weight such as 1kg or 100g nearby to give them a sense of how many times heavier the pumpkin might be. Record the guesses - the nearest wins a prize. Don't let these Pumpkin Puzzles put you in a Pickle!! For this you need a number of jack-o-lanterns and some cocktail sticks. Cut the pumpkins into a number of pieces. Teams of about 4 have to work together to piece them back together using the cocktail sticks to hold pieces in place. This is a nice activity for a school Halloween event. 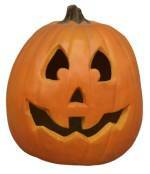 A large jack-o-lantern picture or simply spirals or other shapes are drawn in chalk outside in the playground. Each child should have one or two jam jars (request that these are brought into school in the days leading up to your event). Small night-light candles are lit and popped into the jars (by adult helpers). Each child then places their candle jar down in the playground following the pattern. If enough candles are added the effect of this at night is really enchanting. Can you tell "witch" member of staff it is? The perfect way to end your school Halloween Party. Have a teacher very well disguised dressed as a cackling hag. The children each choose a wrapped lucky dip gift from her cauldron as they leave the party. But who was the mystery witch? You'd never guess it was sweet Miss Jones the reception class teacher!